Vanilles du Monde is a set of five vanilla-based Eaux de Toilette from La Maison de la Vanille. Each of the fragrances focuses on vanilla from a specific country, and each is given a theme; Eau Noire du Mexique is called "the powdery accent" and has notes of bergamot, rose, jasmine, vanilla, iris, opoponax, tonka bean, and patchouli. Eau Noire du Mexique starts with subtle spice notes and lots of bergamot. The spices, unfortunately, are indistinct and fairly short lived. The dry down is vanilla with light, well-blended florals. The patchouli is no more than a whisper, and there is a very slight undertone of something like bitter chocolate. It is very soft and creamy, but the powder is restrained, and thankfully, so is the sugar, so while it is foody, it feels more sophisticated and grown-up than your average frosted vanilla cupcake fragrance. It is by far my favorite from this line, although I have yet to try the Fleurie de Tahiti. The lasting power could be a bit better — an Eau de Parfum with a bit more of a spicy kick would be lovely — but it is a nicely done comfort scent and very reasonably priced. 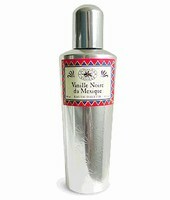 Eau Noire du Mexique is $32 for 100 ml. It is also available in a body lotion, or in a coffret set with all five of the Vanilles du Monde (15 ml each for $28). For buying information, see the listing for La Maison de la Vanille under Perfume Houses. Thank you for lovely review, R! I have been curious about this one, and now I have an incentive to try it at last. Mexique, for me is one of their best, your correct in commenting, colombina, how short lived this fragrance is because the whole line last on me about 10 minutes. Very sad, but I would by the sampler again from luckyscent. LOL — and I was afraid of the powdery accord, of course! Wow, this one lasted considerably more than 10 minutes on me, but doubt it made 3 hours. It really last on me just 10 minutes, Ha! Ha!, nowsmellthis, that why I only wear this at night, every night, before bed because of it sweetness that smells sooo good! Divine Des Tropiques is my vanilla Holy Grail! Love it. It turns soft chocolately on me and has good staying power. I agree that you wont like Tahiti. This is my favorite from this line. It lasts reasonably long on me for an edt. I added Mexique to my vanilla collection because it is neither sweet or foody (I have too many of those already!). At times, it is too powdery for me, but I'm never overwhelmed. It's a FBW year-round vanilla at a great price. Iris, Agree it isn't too sweet or foody. I like the even cheaper Ecco Bella for the same reason. S, interesting! They smelled very different to me: des Tropiques was very beachy and Antilles had tons of patchouli. This one & Madagascar were my favorites, although I must admit that I'm not a huge vanilla freak. But vanilla is perfect for the cold & wet & yucky week we are having here! Vanille Noire is my favorite of the line, other favorite is Madagascar, but I really like them all. Just bought the matching lotions from beautyhabit – they last all day on me. T, I liked Madagascar too, but I think this is the only one I like well enough to wear regularly. But then, I am not a big vanilla fan…only in yucky weather I think. The weather is lovely here today and I have lost all interest in vanillas already, LOL! Wow, I am way late… I just found this entire collection of 'maison de la vanille' in Montreal just yesterday! in an odd industrial area chic new boutique… I smelled them all and this Vanille Eau Noire du Mexique was the only one that caught my attention. I was about to buy it (59$ here) when I saw they had the entire line of 'relatively new' Comme des Garçons fragrances… I couldn't make up my mind on which CDG fragrance to buy, so I left, frustrated… Any suggestions? I am a fan of the CDG White scent. Click on “Perfume Reviews” on the top menu, and scroll down to CdG. I like lots of their fragrances, too many actually to make a simple suggestion. I do think the Vanille is nice, but not sure I'd buy it — there are probably more interesting vanilla scents on the market. Hmmm I think you're right about the Vanille scent. I'll keep looking/sniffing around! I'll go check out your CDG link! Thanks!